Yesterday's chair from the Share Shack has been updated. 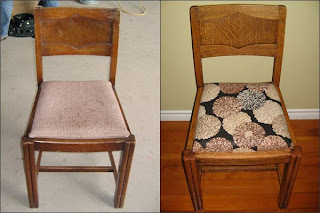 All within the span of 24 hours the chair went from frumpy and ugly to gorgeous and fun. I love this chair! My costs on this update were minimal - $1 for the chair and under $5 for the fabric. 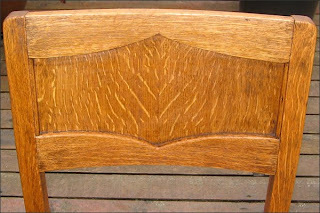 I removed the shellac in a jiffy then used the same stain as my side dresser. The wood looks amazing especially now that you can see the grain. Looks great! Love the wood on it! Thanks Jackie - I love this chair! It worked out better than I thought it would. 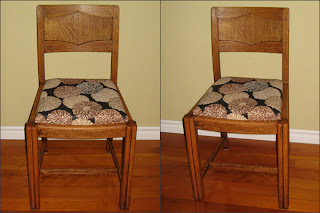 Now this is one NIFTY THRIFTY chair...looks great! so cute, love that fabric!